The APX7500 multi-band radio delivers instant interoperability into the hands of mission critical first responders. 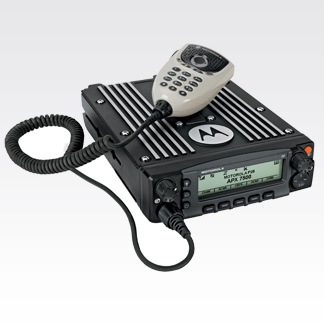 Motorola's fourth generation P25 mobile radio is capable of multi-band interoperability and can operate in any two of the following frequency bands (700/800 MHz ,VHF, UHF Range 1, and UHF Range 2). It provides backwards and forwards compatibility (FDMA and TDMA) and integrated GPS for outdoor location tracking. The APX7500 offers a complete control head portfolio with 5 options, giving users the flexibility to choose the control head that best meets their operational needs. Designed with mission critical technology, the radio amplifies public safety officials' ability to keep the community safer than ever before. Uses color alerts to notify you of the radio mode, potential emergencies and specific events. Configure radios to adjust audio level, lighting and tones through user-selected or automated options. Whether on surveillance or working in bright sunlight, you can customize settings as needed. Offers a free form or canned messaging solution so you can efficiently and discreetly send and receive messages to and from subscribers or dispatch operators. Consolidates all call lists to make all information about a particular contact easily accessible. Navigate through channels/talkgroups and zones while an audible, pre-recorded voice file provides a description of the selected channel or zone. Provides twice the voice capacity so you can add more users to your system without adding frequencies or infrastructure. With its integrated GPS receiver, the outdoor location of a vehicle can be transmitted to map-based location software. Multiple frequency bands supported with best-in-class transceiver specifications and performance. Scan multiple protocols, including FDMA and TDMA systems and multiple RF bands. Equipped with FIPS certified encryption hardware for secure communications. Add option cards and data applications to upgrade to the latest functionality. Expandable memory slot lets you store future data applications. Increased memory is available as your technology needs grow. Dimensions (H x W x D): 2.0" x 7.0" x 9.6"